Our knowledgeable team members understand how to help you with any of your storage needs. Unlike many competitors, our self-storage facilities in Atlanta also offer a free move-in truck with your storage rental at participating locations. Don’t Miss Out on this Special Move In Offer! 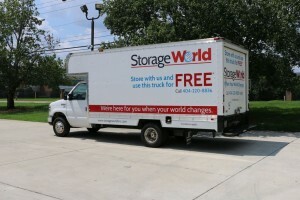 Make moving into your storage unit easy with the use of our free moving truck. Instead of making multiple trips or spending extra money on a rental truck, you can use one of our free move-in trucks with your storage rental at select locations. Our free moving truck rental special is available at our Decatur – Panthersville and Decatur – Flat Shoals storage facilities. Unload the contents into your storage unit. Keep in mind that the free truck is based on availability and do get booked very quickly, so schedule your free move-in truck in advance. There are also certain terms & agreements for the free move-in truck, such as paying for fuel. Have any questions? Talk with a Storage World representative near you for more information. Keep in mind that the free truck is based on availability and do get booked very quickly, so schedule your free move-in truck in advance. There are certain terms & agreements for the free move-in truck, such as paying for fuel, so please ask your Storage World representative for more information. Are you ready to reserve a storage unit? Visit our storage facility in Decatur, GA on Panthersville Rd and Flat Shoals Pkwy!